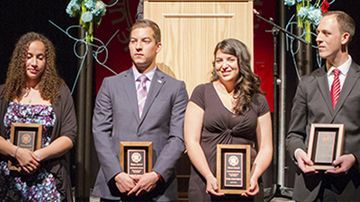 The UNM Dean of Students office is now accepting nominations for the 2017 Clauve Outstanding Senior Award. The award recognizes outstanding seniors who have performed well academically and made significant contributions to the campus community through their exceptional leadership and involvement in student organizations and activities. The application form is available on the Student Activities Center website. Applications are due by Friday, Feb. 17 at 5 p.m. in the Student Activities Center. The Clauve Awards wil be presented at the Recognition Reception planned for April 21. For more information and how to apply, contact the Student Activities Center at (505) 277-4706. For questions, email leadership@unm.edu or call 505-277-5599.